I've made this once before, and it turned out allright... but having recently seen Nigella make it on Forever Summer (the TV program), I was inspired to give it another go. 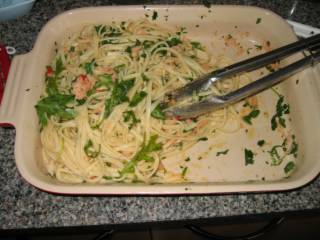 You mix garlic, salt, chillies, oil, crab and lemon in a pestle and mortar, and toss it through cooked linguine, before adding watercress and chopped parsley. We didn't have enough crab (just one tin), so I chucked in a tin of delicious Sirena tuna as well. By the way, this is the most fabulous tinned tuna, and has now become the only one I will eat willingly. Also, watercress is difficult to find at supermarkets, so I used rocket. I thought it would be suitable as they both have a peppery taste. I was right. I apologise for the presentation of this dish - we devoured half of it before I realised that I hadn't taken a photo! And it is really delicious. I ate it for lunch, and again for dinner. I would have eaten it for supper that night (straight after the Scissor Sisters' concert! ), but it was already finished, sadly. The lemon zest gives it the freshest taste - summer in a bowl! I think the last time I made it I must have been too lazy to zest the lemon, and also I probably skimped on the oil. For shame, for shame. It makes all the difference!